On 11 July 2016 the founding meeting of The German-Ukrainian Academic Society (Die Deutsch-Ukrainische Akademische Gesellschaft e.V.) has been held in Berlin. 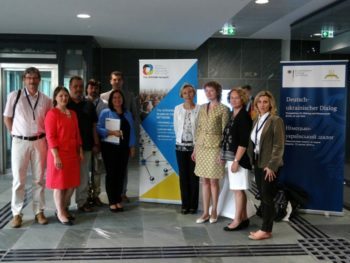 16 scientists from 10 German cities came together to found an NGO with the main aim of fostering academic cooperation between Germany and Ukraine (see press-release from 17 July 2016). The German-Ukrainian Academic Society is a non-profit association (gemeinnütziger eingetragener Verein), registered by the District Court Berlin/ Amtsgericht Berlin, VR 35585 B. If you support our goals – we invite you to join our Society! Please refer to the membership page.